I came across this article on one of the birding sites on facebook and thought to share it here. It is a wonderful and inspiring read for beginners and experienced birders alike. WELCOME TO THE WORLD OF BIRD WATCHING! It’s very easy to do bird watching – you just need to sit somewhere quietly and any number of birds will turn up, or fly past, or perch in a tree nearby. Then all you have to do is look at them. Simple! You don’t have to know which birds you are looking at, it’s fun just to watch their antics and to hear them communicating with each other and watch them feeding, preening or collecting nesting materials. But being nosy humans, we have to spoil the simple fun of just bird watching by HAVING to know what kind of bird we are looking at. Crazy, isn’t it? And then, when we get better at this bird identification thing, we start trying to tick off all the birds in our books, and adding to the list at every opportunity. We are our own worst enemies! So, in order to do bird identification, we actually have to learn the powers of observation. We need to really LOOK at the birds, LISTEN to the birds and LEARN to understand the different behaviours of birds. One important factor to remember when starting or enjoying a hobby such as birding is that it is NOT a competition. Many ‘birders’ spoil their own enjoyment of just watching birds by having to go around aimlessly (almost manically) ‘ticking’ off yet another bird to add to their list. What enjoyment is there in that? To brag to your friends (who probably couldn’t give a continental anyway) that you now have seen and identified over 400 species INCLUDING the rare double-breasted mattress flapper! I often imagine these types as skulking along try to find a rare bird – eventually seeing it and immediately ticking it off in their books – and off immediately to find another – without even spending some time watching and enjoying the bird itself. Rather spoils the whole idea behind bird watching, doesn’t it? With birds, even if you have the best binoculars in the world, you will find that you’ve just got the bird sighted and it will fly off! Therefore you usually only have a few seconds to take in a whole load of detail. Don’t despair, it is difficult for all of us, and with patience you will learn to quickly take in the following points and make positive identifications. A good way to start is to try doing it in pairs (buddy system) – one looks at the bird through the binoculars and the buddy asks the questions below, and takes notes. Swap around, so that both buddies get to look and ask the questions. I don’t know about you, but I was born on the cusp of the metric and imperial measuring systems. I know 30cms is about one foot, because the rulers are that size, but other than that, I find something like 17cms in length from beak tip to tail tip difficult, if not impossible, to comprehend. So – I see a bird and I ask myself…. Is it smaller than a sparrow? Same size, or slightly bigger? This is because I can visualise the size of a House Sparrow, because sparrows are familiar birds that I have known all my life. The metric size of a House Sparrow as measured in a bird guide is 14-15cm. What other birds do you know that are about the same size? Masked Weaver, perhaps? Yup – same size! Then go up a step. Common Mynas (were called Indian Mynas) – pesky aliens, but also very familiar – 25 cms – about the same size as a Cape Glossy Starling – and a member of the Starling family. Rocks Doves (Feral Pigeons) are familiar birds, measuring 33cm. Is the bird you are looking at about the same size as a pigeon? Black-shouldered Kite? Okay, just slightly smaller at 30 cms. Interestingly enough, all the familiar birds I have mentioned are not indigenous birds but were introduced in to South Africa, and all are common in cities and suburbia, that’s why we know them so well. You can choose your own list of familiar birds – and the trick is to type or write them and their measurements down on a piece of card and use this as a bookmark in your bird guide. Learn to distinguish the different shapes or outlines of the birds you are looking at. Does the bird have long legs or short legs, a long, medium or short tail? And what shape is its beak? This is not easy, and it takes a bit of time, but with practise you’ll soon be able to see that different bird families have different-shaped beaks, or short sturdy legs or long thin ones. Some birds have short tails some birds have long tails. Some birds are tiny, some are large, and it’s the in-between birds that are the problem, so leave those until you are feeling more confident. Nobody can miss the Long-tailed Widowbird (Longtailed Widow) with his flowing tail plumes, but he is much more difficult to identify in winter when he’s not in breeding plumage. Or the tiny sunbirds that look a bit like humming birds, but we don’t get humming birds in South Africa, so if it looks like a humming bird, it most likely is a sunbird. No-one can really tell you how to learn to recognise outlines of birds. For myself I find it helpful to actually draw the outlines to get a feel for the shape of the birds. Ornithologists have the luxury of having stuffed birds to look at and touch. If you really do become more interested in birding, there is always the opportunity to learn how to do bird ringing – where you catch wild birds and ring them for research purposes. This will give you the opportunity to literally have a bird in the hand – and not in the bush! Visits to bird parks, zoos and museums are also very helpful places to familiarise yourself with the various bird families and sizes, and beaks, etc. There is now a helpful field guide available that actually groups the birds together using colours as the identifying criteria, as opposed to the standard guides that split the birds into waders, ocean-going birds, seed-eaters or insect-eaters, for example. One thing that is very important with colour is to try and also note the colour on the beak, legs and feet. This can be a critical tool in identifying even a seemingly easy bird. For instance, look at the egrets. Most of us know what a Cattle Egret (often called a Tick Bird) looks like, but how would you distinguish a juvenile from a Little Egret? Apart from the Little Egret’s crest – LOOK at those feet! Bright yellow on the Little Egret – black on the Cattle Egret. So, colour is more than the overall picture, it is detail that you are going to have to learn to see. 4. DOES IT HAVE A DISTINCTIVE PATTERN OR MARKINGS? Now, I know you are probably perplexed by this – patterns on birds? Well some of them DO have patterns – look at the francolins, the Thick-knees (Dikkops) and the Guineafowl, the various species have different patterns from one another – look at the differences. Look at the Woodpeckers. Now, it’s absolutely no use saying that you saw a woodpecker with a red head – most of the little blighters have red heads! So, what sets them apart, size, yes, location – mmm maybe, but pattern certainly? Look at their breast feathers and the patterns on the sides of their heads. A great help to the fledgling birder is the distribution maps in the standard field guides. I find the guides that have the picture of the bird with the written description and the distribution map all together on the same page the easiest to deal with. If you see a Bulbul in Cape Town, it’s not a Dark-capped (Black eyed) Bulbul, they don’t occur there. It’s a Cape Bulbul – see how similar the bulbuls are, and how subtle the differences? Habitat is another great help. If you’re looking at birds on the seashore they are often waders or ocean-going birds. Birds found in grasslands are usually seed-eating birds or terrestrial insect/rodent/reptile eaters. 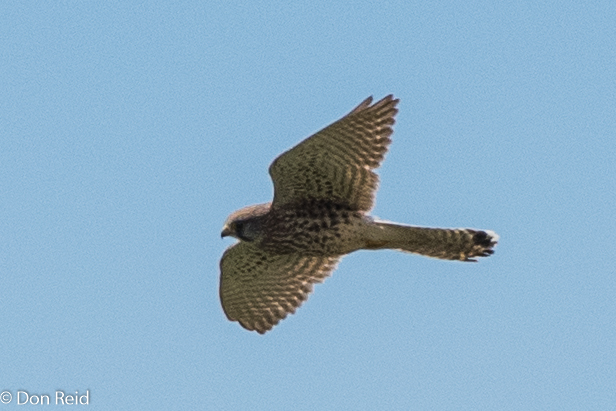 Birds hovering above grasslands are often raptors on the lookout for smaller birds or rodents for lunch. Dams and rivers attract more waders and weavers and some kingfishers. But don’t let the names of birds dupe you – more kingfishers eat insects than they do fish! Therefore, you’ll probably see more kingfishers in woodland, hawking for insects from a branch, than you will see at a dam in a grassland biome. And I have seen more than one seagull strutting along an inland playing field in Gauteng, I can tell you! 5. WHAT TIME DID YOU SEE OR HEAR IT? CREPUSCULAR – Active at dusk and dawn – or in the half-light hours. Therefore, if you see or hear a bird at night, look out for nocturnal birds in your bird book to help you with identification. Again, don’t be fooled into thinking that all owls are strictly nocturnal, African Scops-Owls (Scops Owls) and Pearl-spotted Owlets (Owls), for example, are not and are often heard calling by day! 6. WHAT IS THE BIRD DOING? Is the bird hopping, walking, running, soaring, swimming, wading or climbing about in a tree? Is it swooping, pecking the ground like a chicken, probing in the mud, catching insects, feeding in a tree or gathering nesting material? 7. WHAT SOUND IS IT MAKING? This is possibly the hardest of all to learn, but the easiest way to positively identify a bird because they all have their own unique voices. For me the easiest way to learn calls is to actually hear something calling and try and find the bird – I USUALLY remember it then. I also find videos of birds with their calls much easier than listening to tapes or CD’s – as you can actually see which birds are making which calls. Start by learning the calls of birds in your own garden, or if you don’t have a garden, go to your nearest park or similar. By being observant and going out and looking at who is prattling away, you will find that very soon you will be able to identify quite a number of birds just by their sound. Don’t be put off – you can probably already identify quite a number of birds by their call. How about the Hadeda Ibis? The African Hoopoe, the Red-chested Cuckoo (“Piet my vrou”) or the Crowned Lapwing (Plover) – so you are already on your way! Another way to learn to identify birds by their calls is to put a verse to the call if you can, as in the Red-chested Cuckoo with its distinctive “Piet My Vrou” call. You’ll hardly ever see this bird – but you’ll hear him calling all the time in summer – even at night! How about the Grey Go-Away-Bird (Lourie) – shouting at you or your cat to “Go Awaaaay!”? Feel free to make up your own verses to calls! Anyway, it’s not a train smash if you can’t learn calls, but it does help quite a lot with identification, and there are a few species of birds that are really only identifiable by their call, e.g. the nightjars/ pipits and larks. Look through your field guide often. Look particularly at the different groups of birds which are all conveniently located in the books close to each other. a quick glance. I am afraid there are no short cuts to this process – you just have to keep on looking and looking and looking. Develop more than just a passing interest in birds. An excellent publication is Africa, Birds and Birding that has wonderful in depth articles about birds – breeding biology, behaviour, status and migration – as well as articles on great birding spots. It is such an attractive and informative magazine that it will soon pique your interest in birds even further so that your learning becomes enjoyable and not onerous. Try and go birding with somebody – preferably at about the same stage of birding as yourself. Try not to go with one of those know-it-all types as they will loudly proclaim what bird it is before you’ve even got it in your sights, and you will never learn to identify birds for yourself. Some bird guides are excellent and will let you try out your skills and help you along the way – pointing out the critical points for identification. If you have a friend who is knowledgeable about birds, ask them to take you along on a bird outing – you can always learn a lot, but ask them to let you try and identify the birds first. Never be afraid to make a mistake or to ask for help. As I said in the beginning – bird watching is a hobby to be enjoyed wherever you are and for the rest of your life. It is not a competition to see how many species you can tick off!